Today I just visited Kidderminster but once again filmed all the three steam locos running. Also included are a couple of clips of the Coalyard Miniature Railway. This entry was posted in Sharpo's World Photo Updates, Sharpo's World video updates on February 20, 2017 by Sharpo. 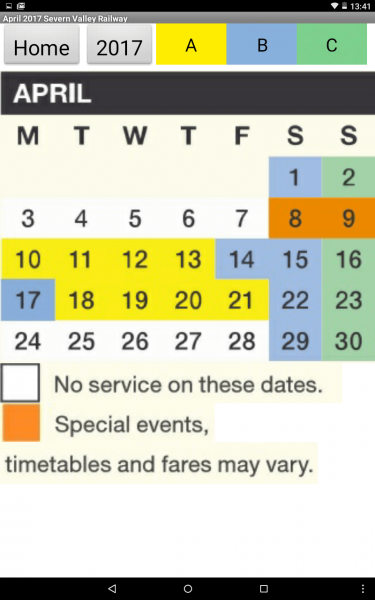 The SVR had been closed for 6 weeks for winter engineering works and on this date train services resumed. It was only a brief visit but I had a ride from Kidderminster to Arley and back, filming each of the three locos. I was too busy talking when the DMU arrived at early so no video of that moving. My journey back from the SVR was just in time to see this ecs working from Worcester to Tyseley. I wasn’t sure what to expect, but at least it was something other than the usual Class 172 units normally seen here. Unfortunately I didn’t see the number of the other Class 153 unit. An ecs move from Kidderminster to Preston. Running as 5Z38 with 57305 leading, it was booked into Rowley loop, this gave me a chance to see it at Old Hill and catch the next train to Langley Green to see it again. This entry was posted in Sharpo's World Photo Updates, Sharpo's World video updates on February 15, 2017 by Sharpo. The Friday morning ecs working was too early for me but the Sunday evening return run from Coventry was at a time I could manage, although it was in the dark. I chose Stourbridge for the video as the downhill runs at Old Hill are rather uneventful and not too good in the dark. A Chiltern ecs set arrived just before the Belle was due, this meant the view from platform 2 would be blocked, but as you see in the video it did set back into the yard in plenty of time. Cropping images of a fast train from a video filmed in the dark doesn’t give great results, but here they are. This entry was posted in Sharpo's World Photo Updates, Sharpo's World video updates on February 14, 2017 by Sharpo. The two Class 68s bring a Northern Belle coach from Crewe to the Severn Valley Railway, running as 5Z80 and will work the ecs the following morning from Kidderminster to Victoria. 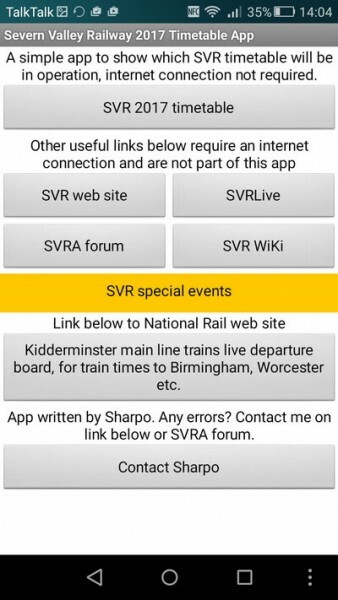 That leaves the SVR about 4am so I won’t be at the station to see that! This entry was posted in Computers on February 10, 2017 by Sharpo. After a suggestion from Ian, I have “centred” the text. It does look better than the original which started close to the left of the screen. This entry was posted in Computers on February 7, 2017 by Sharpo. The previous post showed the app on my tablet, these are screen prints from my mobile. This entry was posted in Computers on February 6, 2017 by Sharpo. It’s that time of year again. 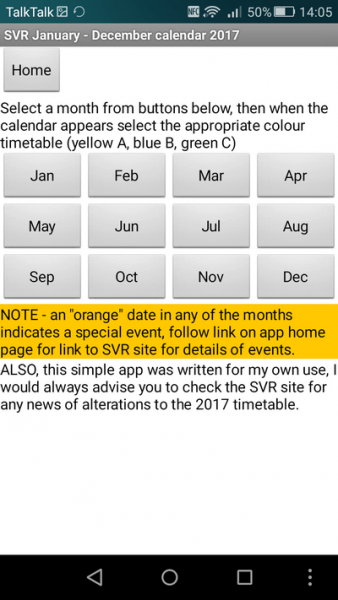 I edited the old 2016 app, added the new calendar and timetables and it seems to be working. I’ve still some testing to do as I usually miss an error or two, but should have it uploaded to Google playstore soon. Below are 4 screen shots from my Acer 10″ tablet, I’ll try and get some from my mobile phone later. 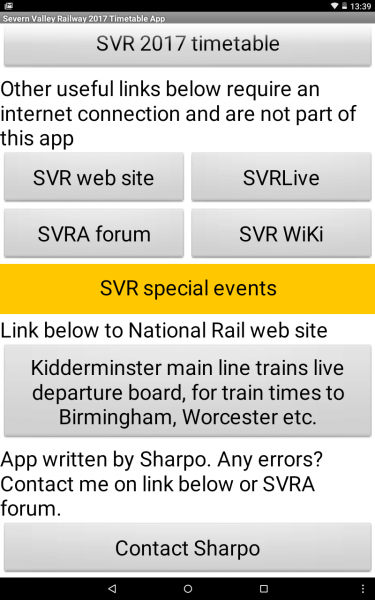 The above is the basic home screen, the main link being to the timetable. Once installed, no internet or mobile signal is required to access it. 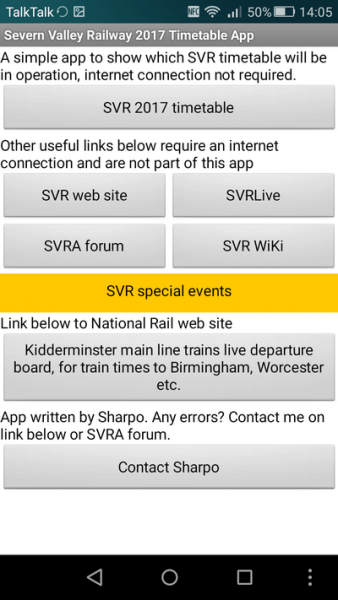 The other links to SVR, SVRLive etc. obviously do need an internet connection but are added as they are useful links. 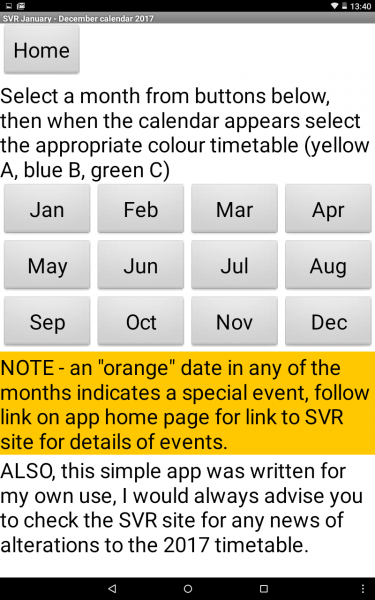 The page above gives the option to select a month, which will appear as the example below. 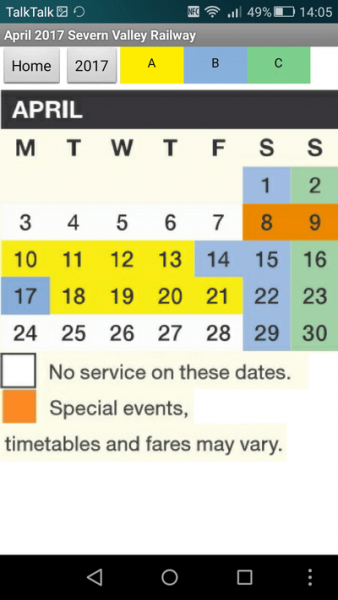 Looking at the above, there is a choice of 3 timetables, yellow blue or green, so touching the A B or C buttons will display a timetable like the one below. That’s it. 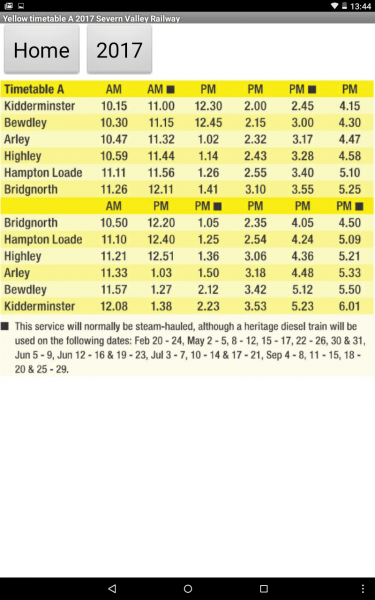 Tipping the screen sideways will enlarge the print on the timetables, so even the small print at the bottom of the page should be clear. 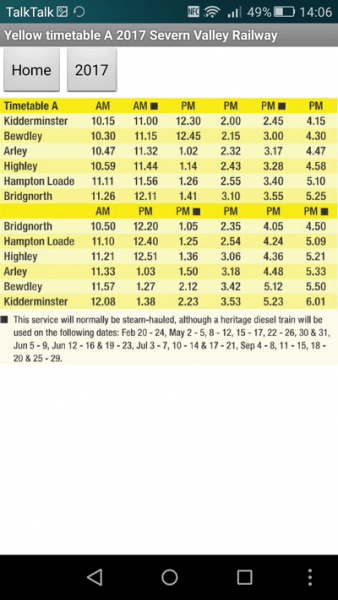 It was announced today that the Northern Belle stock will be based at Kidderminster on the Severn Valley Railway. 57312, with 57305 at the rear, is seen passing through Old Hill with 5Z25 Crewe to Kidderminster empty stock. Later in the day the two locos are seen returning to Crewe. Link to YouTube video. This entry was posted in Sharpo's World Photo Updates, Sharpo's World video updates on February 2, 2017 by Sharpo.